American Standard is one of the most recognizable brands on the HVAC market, and its products have an excellent reputation among consumers and professionals. In some form, the American Standard Companies have been around for nearly a century, and have been a major HVAC brand for decades. With its impressive history of industry success, American Standard has the engineering, expertise and distribution network that property owners need from their HVAC brand. 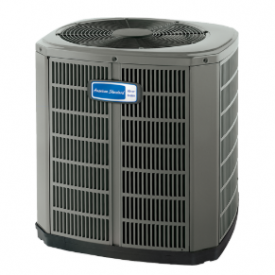 American Standard’s air conditioners are built for residential properties. Consumer Reports, a national product testing magazine and website, named American Standard as the most reliable air conditioner brand on the market. According to their survey, two-thirds of American Standard owners were still completely satisfied with their system five years after its installation. It’s difficult to achieve that level of customer satisfaction in the HVAC industry, as there are many factors that can affect system performance and longevity. American Standard’s products are fine examples of engineering, with their AccuLink control board, Duration variable speed compressors and its aluminum Spine Fin coil. The manufacturer’s HVAC models are also noted for their quiet operation, which is a product of smart sound insulation placement. 1. The Silver Series – This series of air conditioners are the economical choice and provide a cost-effective option for homeowners that need to keep their upfront expenses low. There are several options in this line, including the Silver 13, Silver 14 and Silver 16. The Silver 16 is also available in a low profile design for properties where space is tight. The number refers to the air conditioner’s SEER rating, which encapsulates the model’s energy efficiency in a single number. The greater the SEER rating, the more efficient the system is. The brand’s Silver Series isn’t quite as efficient as its Gold and Platinum products, but even the least expensive Silver model is still more efficient than systems from five or 10 years ago. That means most homeowners can boost their system’s efficiency while still saving money with a Silver product. Consider the Silver 13, which is American Standard’s least expensive model. Even with its lower price point, it still exceeds federal requirements and is built with the same quality components that its more expensive models contain. This includes the company’s Spine Fin coil, which is an all-aluminum coil that transfers heat exceptionally well and resists corrosion just as well. The Silver Series is also built with the Durabase basepan, which resists rust, cracks and corrosion, heavy-duty steel louvered panels, an appliance-grade powder finish and rust-resistant screws with zinc coating. The Silver Series comes with a 10-year warranty and most Silver systems will provide more than a decade of reliable performance. 2. The Gold Series – The Gold Series is a step up from the Silver Series, mostly in terms of efficiency. The Gold 17 is the only product in the Gold Series line, and in addition to its increased efficiency, it offers a two-stage compressor. The two-step Duration compressor can operate at full capacity or at 70 percent capacity, giving homeowners a little more control in how they cool and heat their home. American Standard states that the Duration runs at 70 percent capacity most of the time, only switching to full output when the temperature demands it. 3. The Platinum Series – American Standard’s flagship products, the Platinum Series can achieve SEER values of up to 22, and that’s only the start. In addition to its elite efficiency, the Platinum series comes with the Duration variable speed compressor. American Standard has optimized this compressor so that it runs as quietly as possible. According to the company, its Platinum Series produces noise at a level that’s four decibels lower than its competitors. When the compressor is operating at lower speeds, it’s even quieter, so it avoids the noise that comes with sudden on and off cycling. The Duration compressor can achieve extremely precise compressor capacities, down to 1/10th of a percentage point. This means the Platinum comes with a compressor capable of hundreds of stages, ranging from 30 percent to full capacity. The Duration selects the appropriate stage automatically, preventing temperature spikes and wasted energy. The Platinum series is also designed with AccuLink, which imparts modern communication technology into the air conditioner. With AccuLink, the air conditioner will automatically alert the homeowner if service is needed, allowing the homeowner to respond before a technical issue becomes an expensive failure. American Standard is a respected, prolific brand when it comes to air conditioning, and with many models to choose from, there is a perfect match for every home.